Are you looking for delicious, gourmet coffee available in a wide selection and at great value? Then “San Francisco Bay Coffee” is for you! We’ve developed a line of unique custom blends, exotic regional coffees, and single estate coffees available in 12 ounce and 2 pound bags. All are environmentally and socially responsible gourmet coffee offered at the best possible prices. We stand for premium, sustainable, direct trade coffee at prices you’ll love. We like to say our products are grown for good. Our Community Aid Program has restored thousands of acres of rainforest by farming only with shade grown farms, and planted our own coffee on our own organic farms. Our One Cup single serve coffees are compatible with Keurig K-Cup brewers and other brands of single serve brewers. Our reputation reflects on us as a family. As such, your satisfaction is our top priority, and we stand firmly behind the quality of all of our products. If you’re not happy with your purchase for any reason, we will make it right. FLAVORFUL VARIETY: With our variety pack of OneCup coffee pods, you can start your day however you wish. Choose from French Roast, Breakfast Blend, Rainforest Blend or Fog Chaser for the perfect cup, every time. Pour over ice for delicious iced coffee. QUALITY COFFEE FROM A FAMILY COMPANY: The Rogers Family Company’s mission is to search out the finest Arabica varieties and roast the richest, most flavorful coffees available anywhere while making the world a better place one cup of coffee at a time. 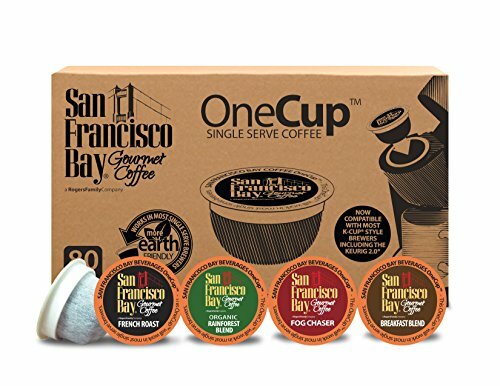 START THE DAY RIGHT: Try San Francisco Bay OneCup K-Cup pods if you’ve enjoyed coffee from Keurig, Nespresso, Starbucks, Lavazza, Peets, Walden Farms, Donut Shop, Green Mountain, Café Bustelo, Folgers, McCafe, Gevalia, Nutpods, Tassimo, or Mount Hagen.